The Premier Prism Assembly features a copper-coated canister-type prism. It's waterproof and has a M20 universal mounting thread. The tilting holder is anodized aluminum and features an improved locking clamp screw design and an 18-gauge steel target. 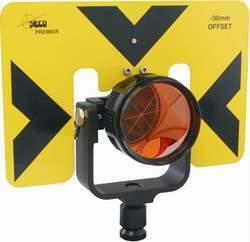 The prism can be mounted in either 0 or -30mm offset positions.